This handspun cowl is inspired by the glorious colours of New England’s woods in the fall, and will work up super quickly in any bulky yarn you might like to use. The pattern includes instructions for spinning a 3-ply bulky weight yarn for your cowl, or you can substitute with commercial yarn. Final size of the cowl as written is approximately 15 inches in circumference (unstretched), and 13 inches wide, but you can continue working the pattern until you run out of yarn, making a cowl of any size. The yarn used for this project is a 3-ply bulky weight, spun worsted style (short forward draw). The wpi for the singles is approximately 27 wpi, and the final yarn comes in at 8 wpi. This pattern is suitable for the adventurous advanced beginner. It requires starting with a provisional cast on, knitting, purling, increases, decreases, and grafting (Kitchner stitch). Pattern includes both written and charted stitch pattern directions. ~90-115 yds/82-105 m bulky weight yarn, either handspun or commercial. 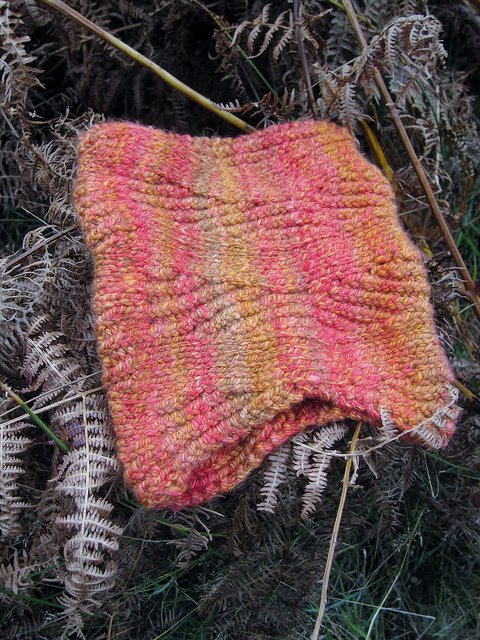 Sample shown in 3-ply handspun Bluefaced Leicester in the "Leaf Peepers" colourway from Porpoise Fur. US 10.5/6.5 mm needles (straight or circular), or size needed to get gauge. An extra needle or stitch holder for the provisional cast on (Judy’s Magic Cast-on), stitch marker, tapestry needle. 15 stitches/20 rows over 4“/10 cm in pattern stitch.